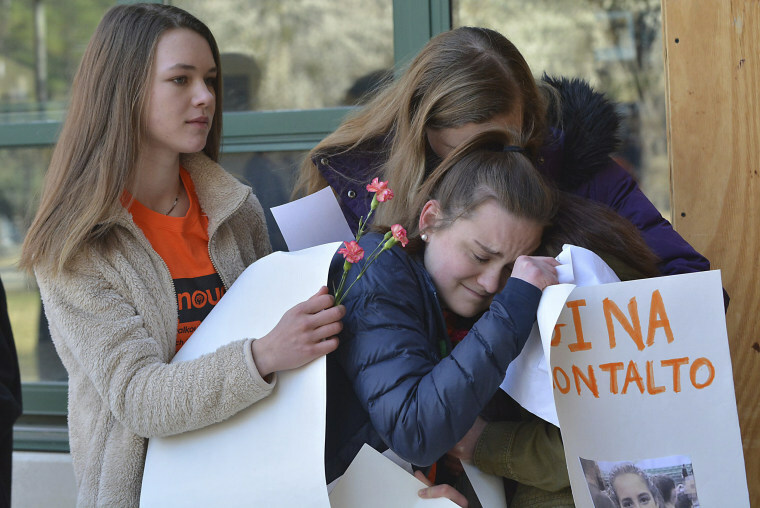 Students spilled out of classrooms in a coast-to-coast protest against gun violence prompted by the deadly rampage at a Florida school. 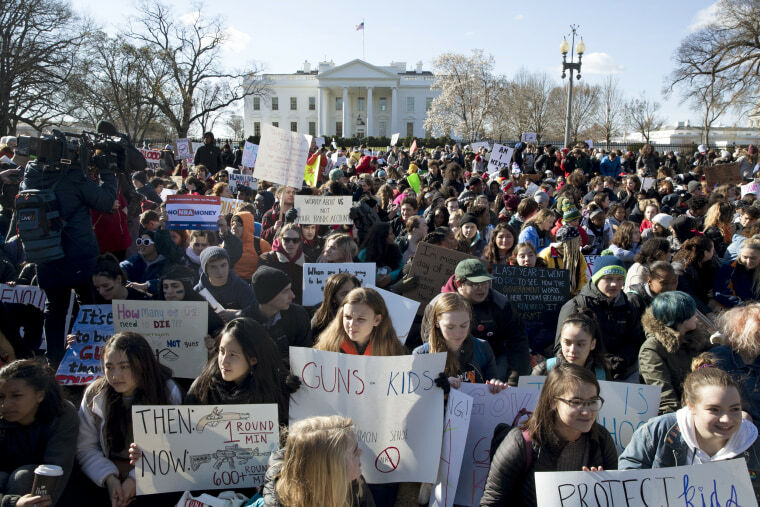 Students participating in a national school walkout to protest gun violence turn their backs to the White House at a rally on Pennsylvania Avenue on March 14. 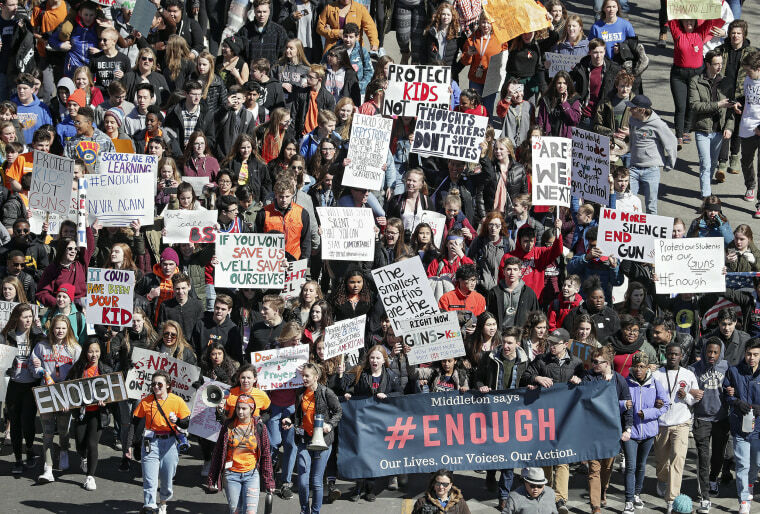 Tens of thousands of students across the U.S. staged a national walkout Wednesday morning, exactly one month after 17 people were killed at Marjory Stoneman Douglas High School in Florida. 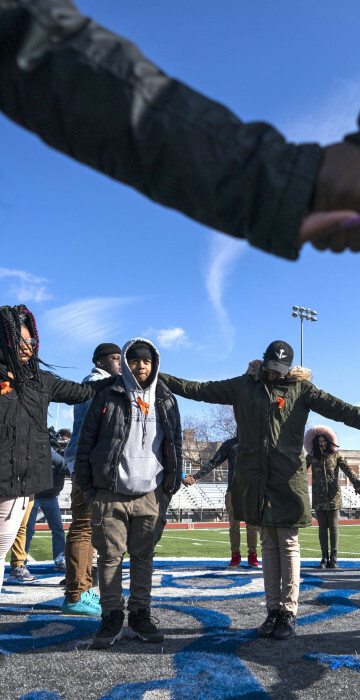 Organizers said the purpose was to highlight "Congress’ inaction against the gun violence plaguing our schools and neighborhoods." 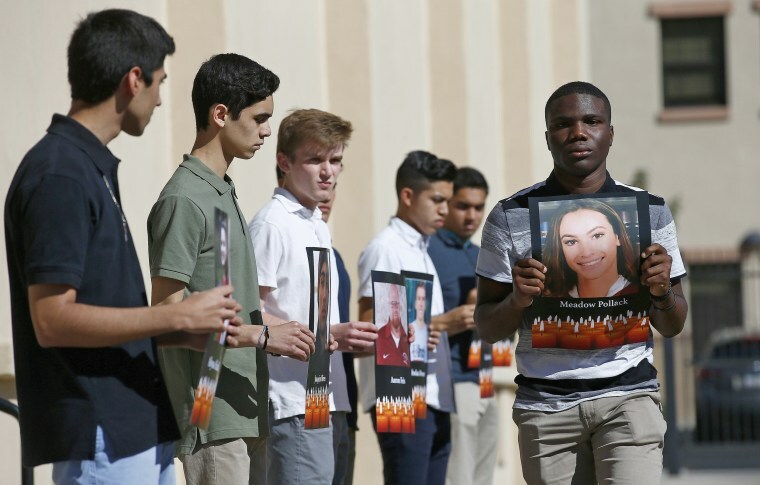 Students hold a ceremony at Brophy College Preparatory high school as they gather to remember the 17 victims killed in Parkland and demand action regarding gun violence. Students march in support of the school walkout in Queens. The protest was held at 10 a.m. local time across time zones. 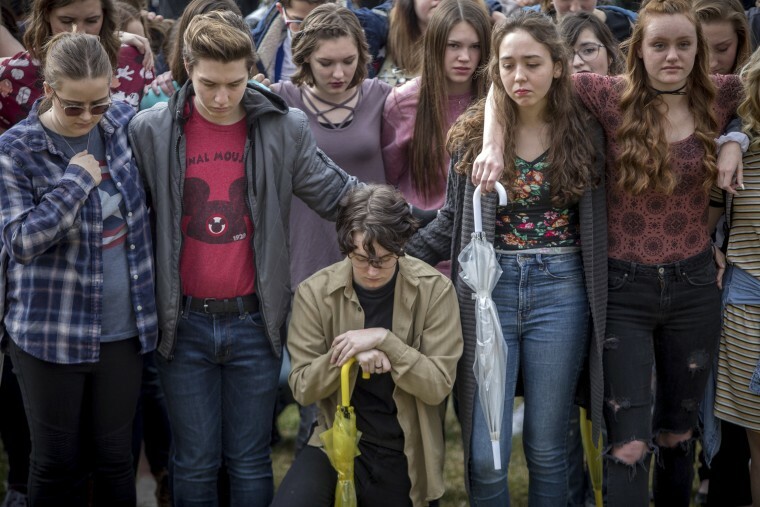 It lasted 17 minutes, one minute for each of the victims killed at the high school in Parkland, Florida. 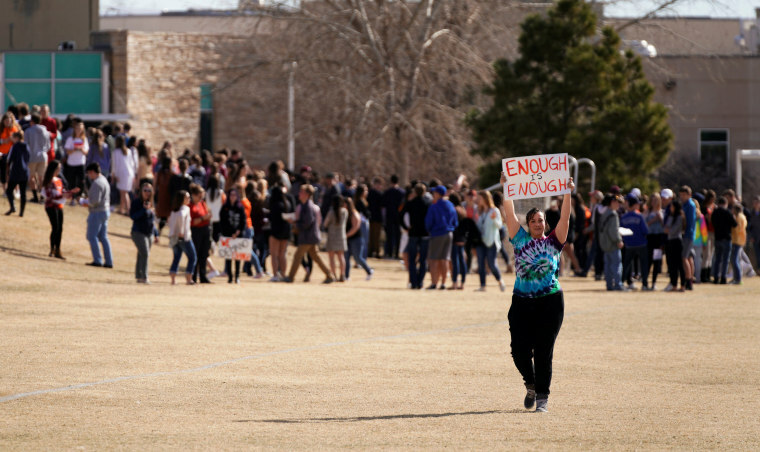 Student Leah Zunder holds up a sign during a walkout at Columbine High School in Littleton. Two gunmen killed 13 people at the school in 1999. 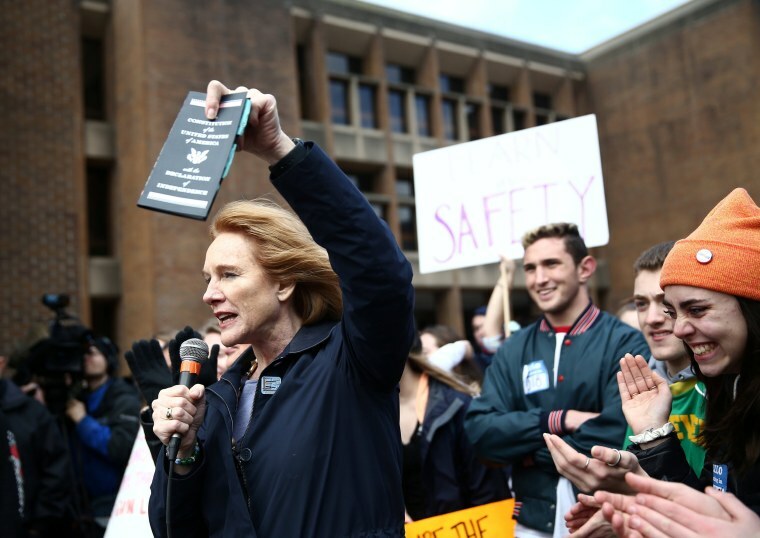 "I believe in the second amendment, but I've read this thing called the Constitution, and second amendment, meet the first amendment", says Seattle Mayor Jenny Durkan as she holds a copy of the U.S. Constitution while speaking to National School Walkout participants at the University of Washington in Seattle. 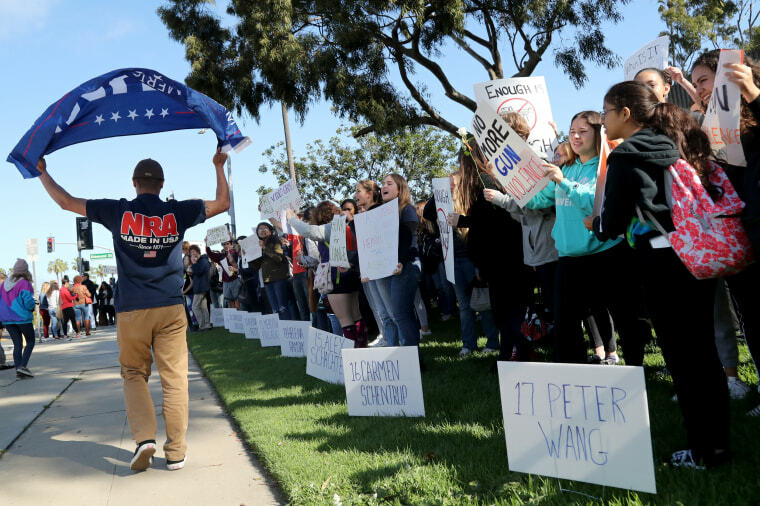 A lone student wears an NRA shirt and waves a Trump flag as other students from Redondo Union High School gather outside their school in Redondo Beach. 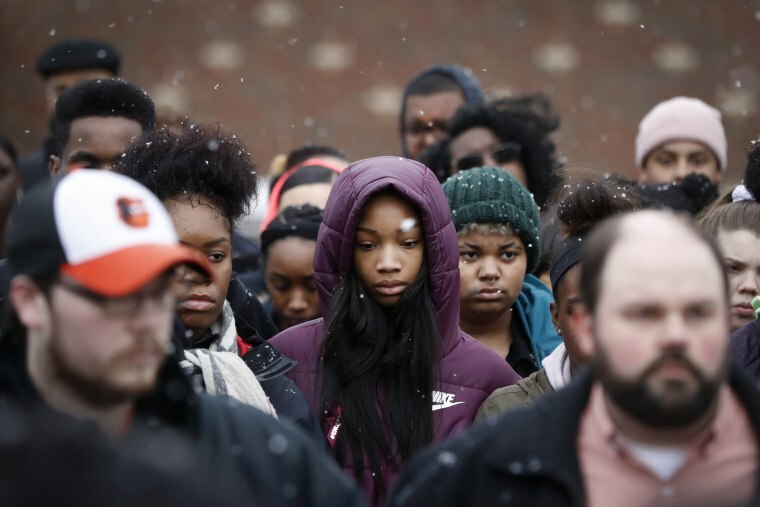 Students gather on their soccer field during the walkout at the Stivers School for the Arts in Dayton. 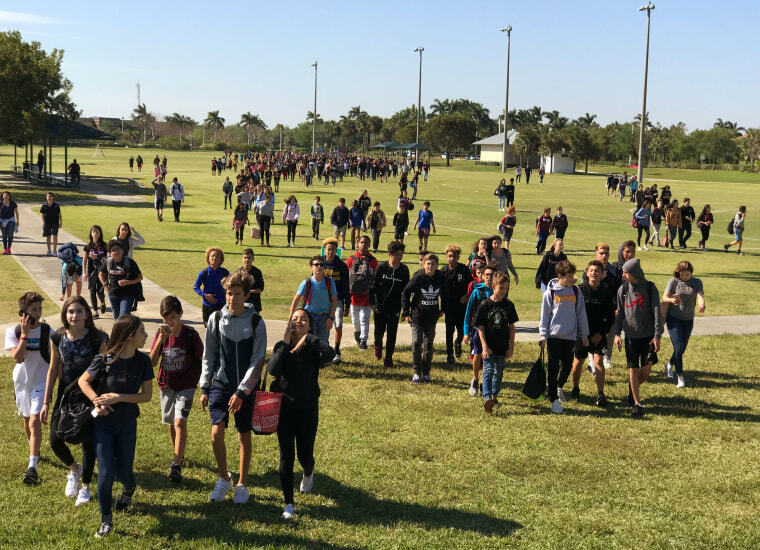 Students from West Lakes Middle School and Marjory Stoneman Douglas High School participate in the walkout. 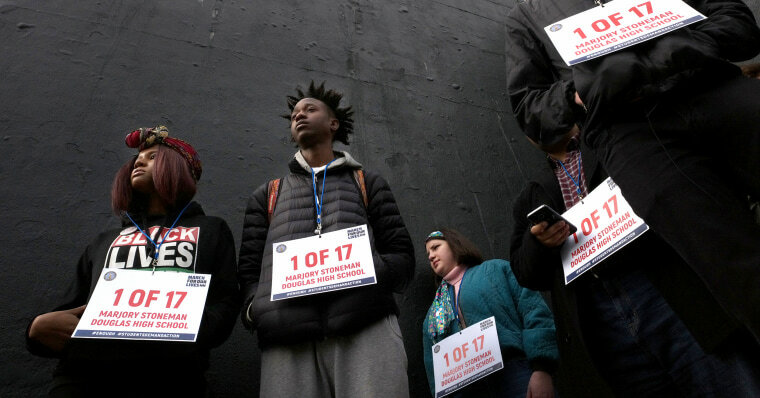 Students participate in a walkout in Prospect Park, Brooklyn. 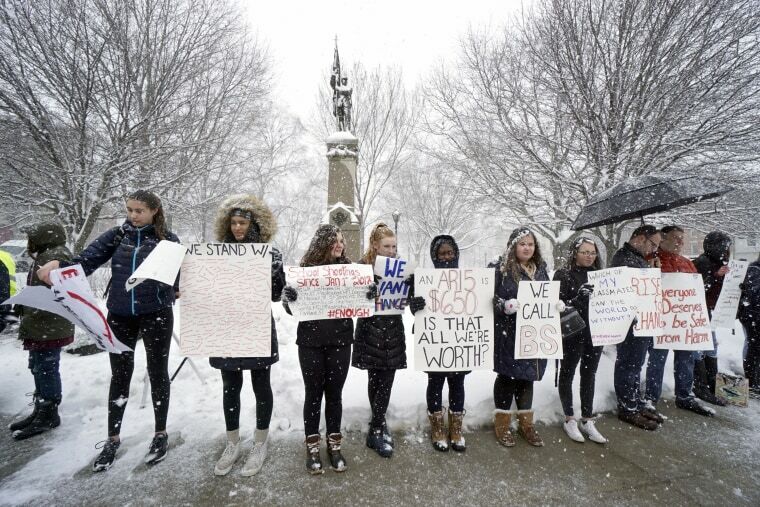 Students from high schools in Pittsfield and surrounding towns stand with signs on Park Square to rally for gun law reform. 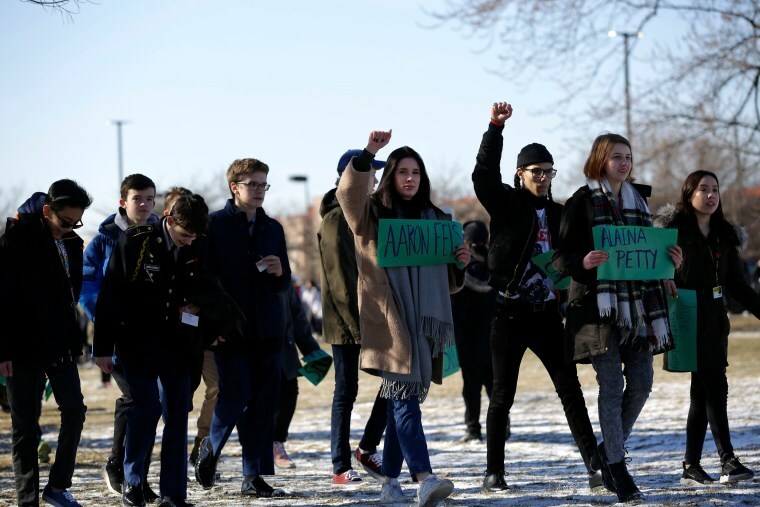 Students at Topeka West High School lock arms. 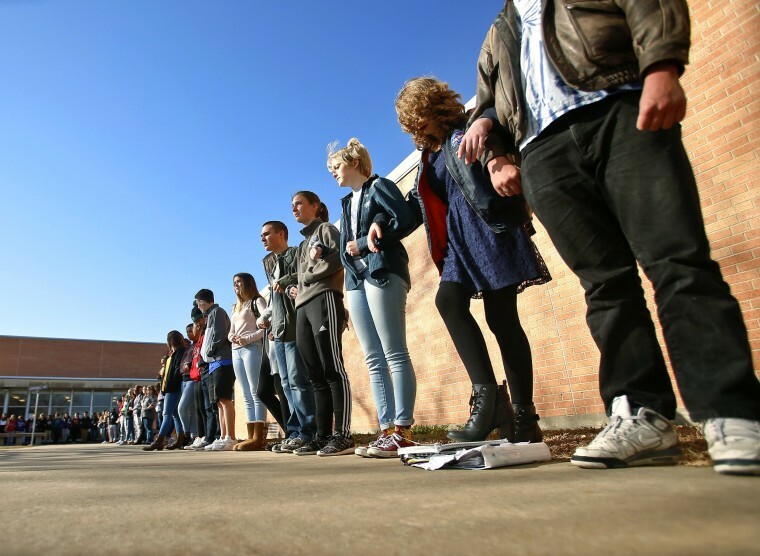 Students at Weber High School observe a moment of silence as the names of the victims from the Marjory Stoneman Douglas High School shooting are read aloud during a school walkout in Pleasant View. 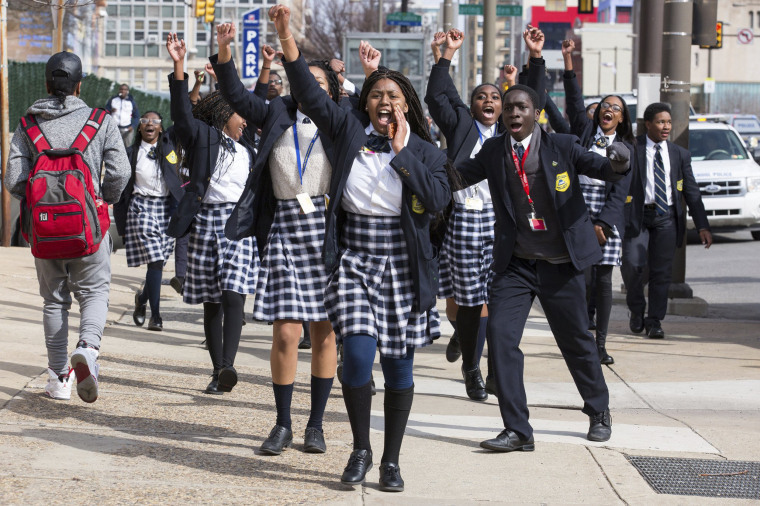 Kayla Brooks, center, a student at the Multicultural Academy Charter School, walks with other students towards the school district's building. 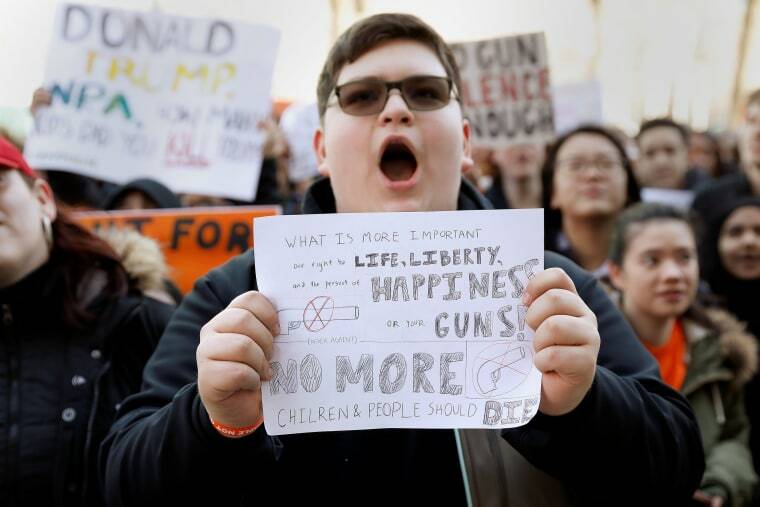 A student holds up a sign in Queens. 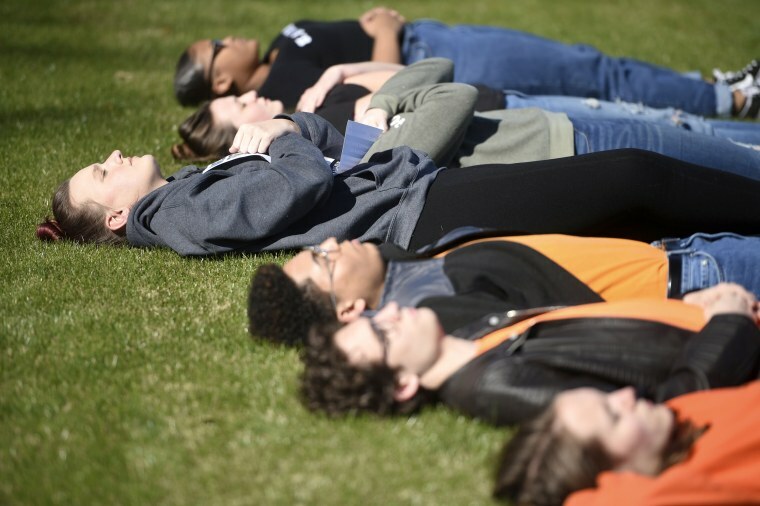 Evans High School student Abby Brooks, 16, left, and other students lie in the grass outside Congressman Rick Allen's office to protest gun violence in Augusta. 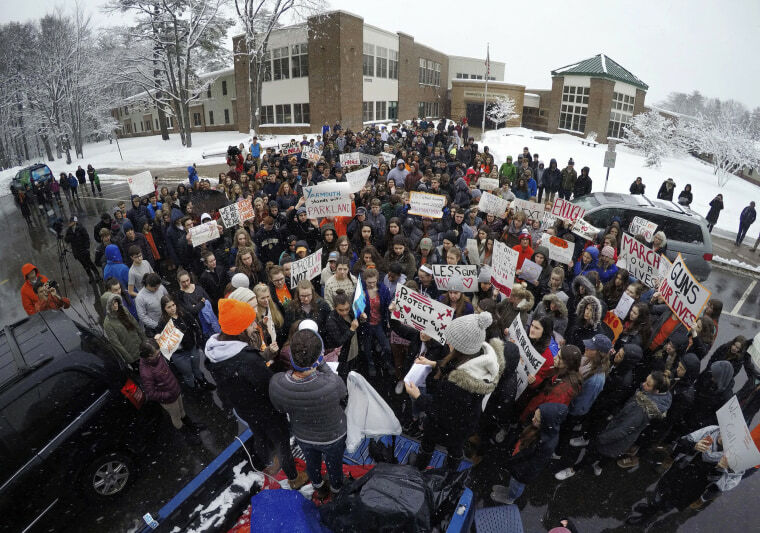 Leaders of a rally address students from the back of a pick-up truck at Yarmouth High School. Yarmouth is one of the few schools in Maine that did not cancel school on Wednesday as the state digs out from the third major winter storm in two weeks. 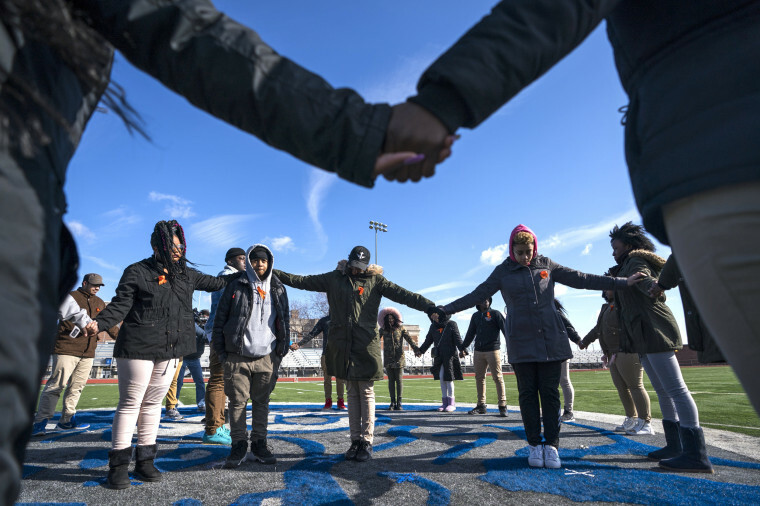 Eastern High School students gather on their football field. 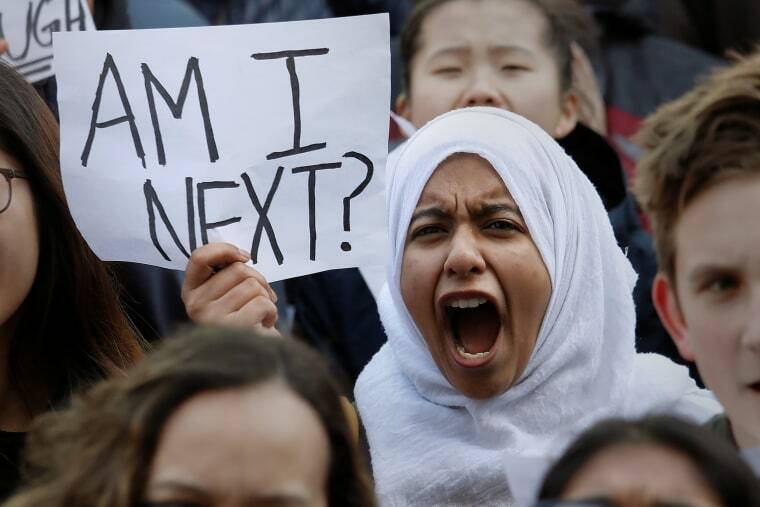 Students from Lane Technical College Preparatory High School hold up signs with the names of the Florida school victims. A student from Washington-Lee High School salutes in Arlington. 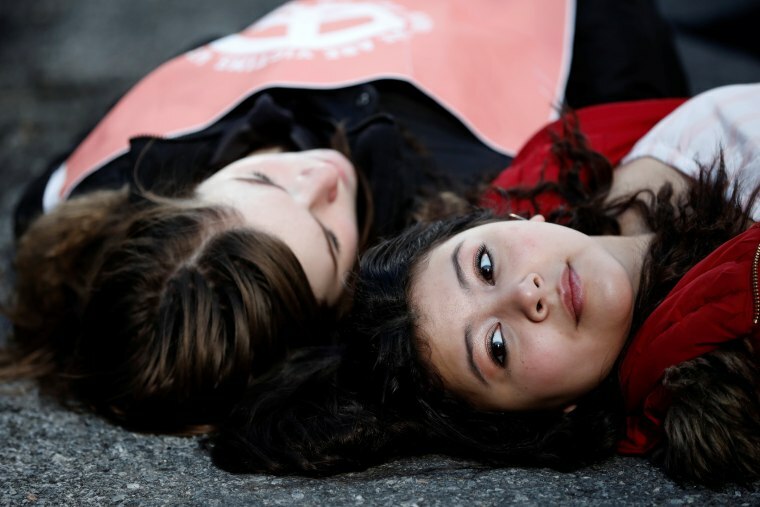 Students from Fiorello H. Laguardia High School lie down on West 62nd street in Manhattan. Students hug in Chapel Hill. 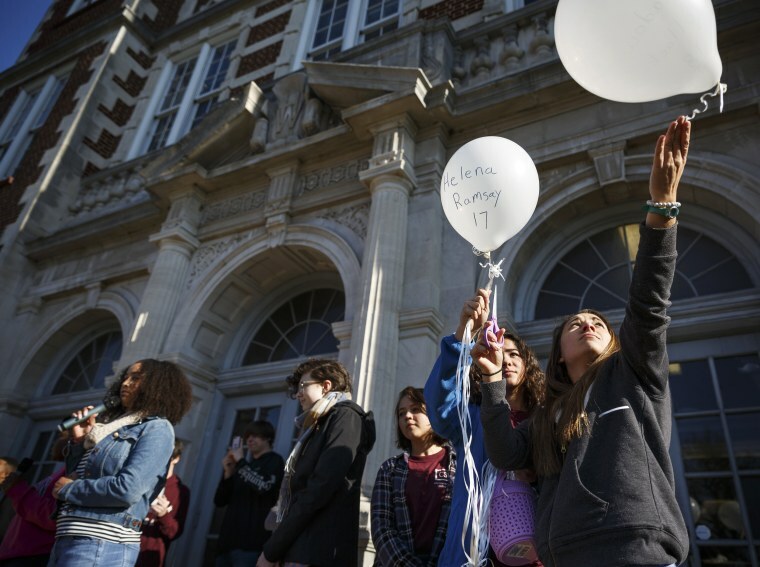 Natalie Ervin, right, and Sophie Albarake, release 17 balloons at Chattanooga School for the Arts and Sciences. 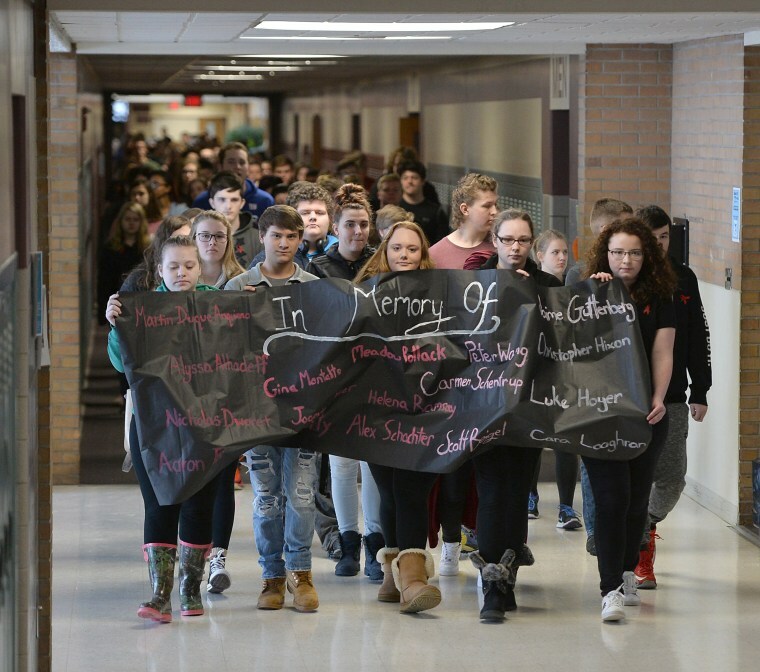 Students hold up a banner with the names of the Florida school victims as they walk out of General McLane High School in Washington Township. 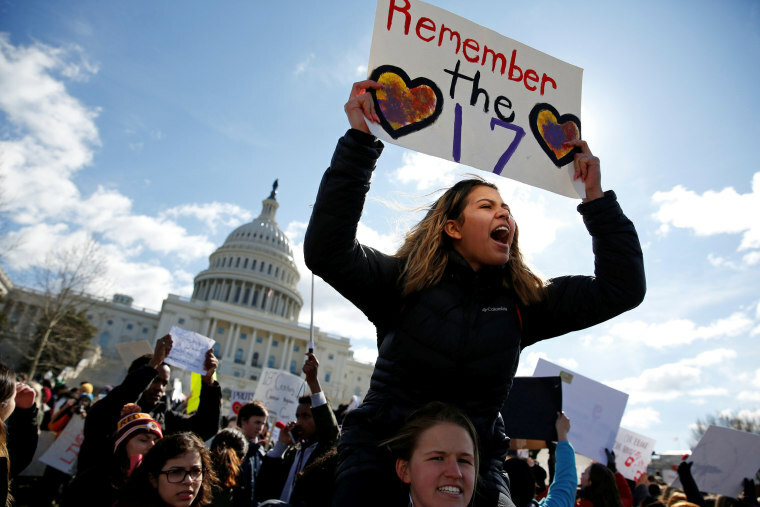 Students from area schools protest outside the U.S. Capitol. 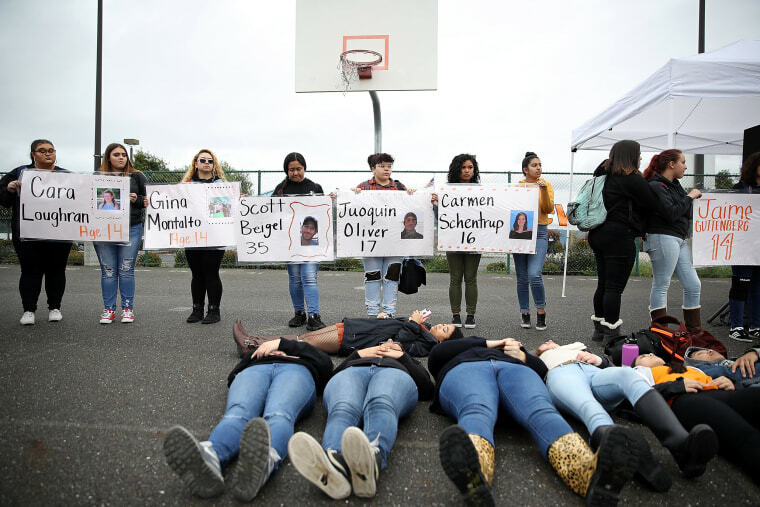 James Logan High School students in Union City hold signs honoring students killed at Marjory Stoneman Douglas High School as they stage a die-in. Students make their way up East Washington Ave. toward the state Capitol during a walkout in Madison. 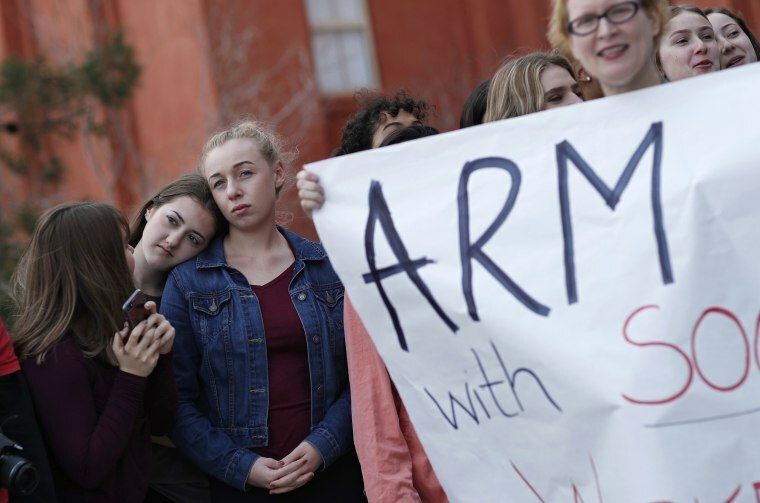 Students gather during the walkout at the Las Vegas Academy of the Arts. 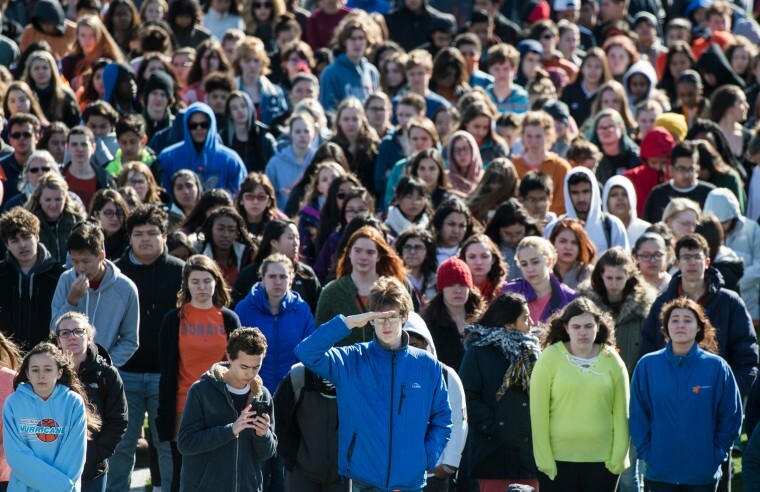 Students at Newtown High School take part in the walkout in Sandy Hook. 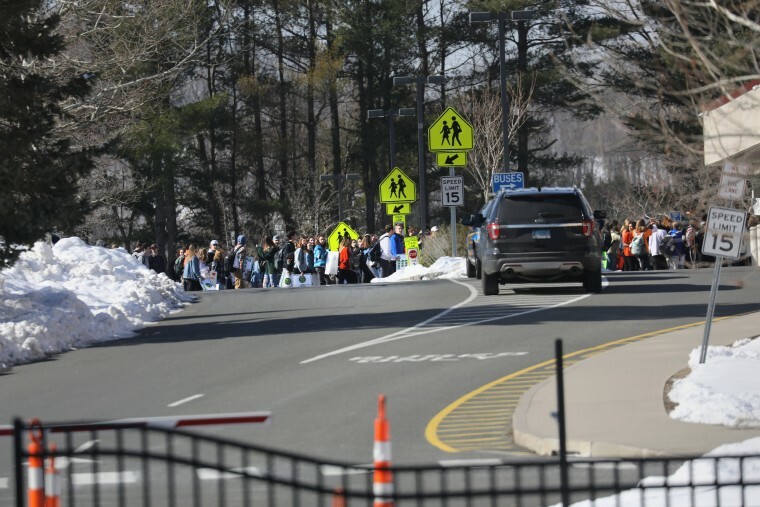 Several hundred students at the school, near the site of the Sandy Hook school massacre of 2012, staged a protest. Media were not allowed on campus for the event. 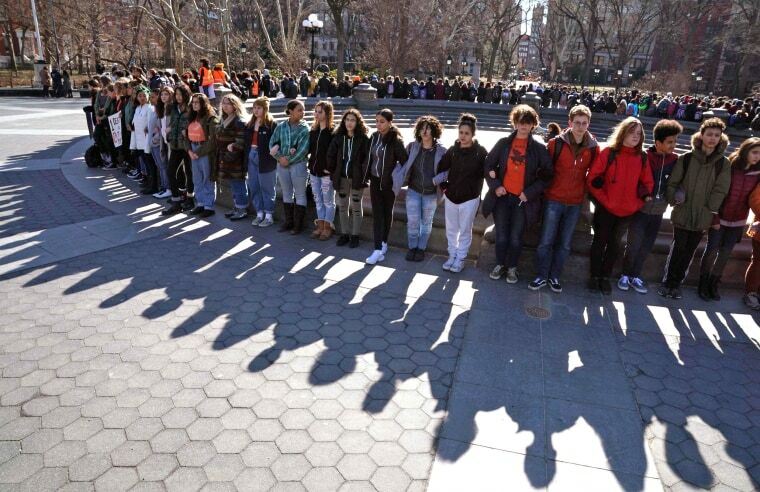 Students from Harvest Collegiate High School form a circle around the fountain in Washington Square Park in Manhattan. 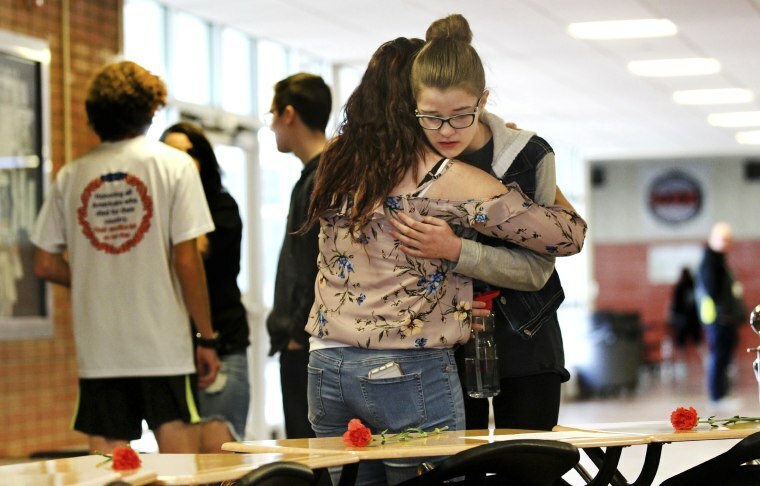 Morgan O'Neill, a junior at Cheyenne's East High, is embraced by junior Amber Thompson after being overcome with emotion during a walkout demonstration at the school. Carnations were placed on desks to symbolize those killed in the Parkland, Florida, shooting.